C-COM wins large order to supply iNetVu® antenna systems in Africa. 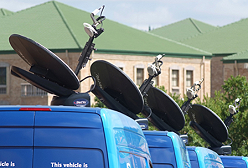 Ottawa, October 2018: C-COM Satellite Systems Inc., the world’s leading provider of commercial grade auto-acquire mobile satellite antenna systems, has announced that it has received orders for approximately US$1.28 million for its iNetVu® antenna systems from various customers across Africa. The systems have been purchased by several reseller partners and will be deployed by broadcast organisations, governments, militaries and commercial customers in the banking sectors.